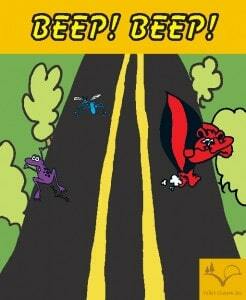 Reinhard Staupe has been kind enough to allow Valley Games to publish his next lightning fast party game Beep! Beep! A leisurely drive through the country side is a relaxing activity anyone would would enjoy, right? Oh look, a moose in the trees to the left, lovely. Oh, and there’s a cute little skunk waddling along the grass adjacent to the road. However, what happens when these animals try to cross the road? The last thing you want is to have an incident with one of these lovely creatures! In this game, players must quickly get these forest creatures out of the way to safely finish your trip. However, sometimes there are just too many and you have no choice but to lean on your horn – Beep! Beep! – and clear the way. This game takes approximately 2-3 minutes to play and the player that successfully saves the most creatures wins the game. NOTE: THERE WERE NO ANIMALS HARMED IN THE MAKING OF THIS GAME! This game was debuted in Essen 2008 and the initial print run has sold out. Due to further production problems the final print run is due September 2009.